Wachira Benjathat, Chatuchak and Queen Sirikit Park Complex is a vast area of park land, beautifully maintained, and a great area to enjoy Thailand's nature right in the middle of downtown Bangkok. 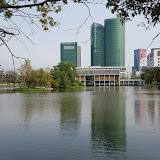 The park complex is located just to the north of the Chatchuchak Weekend Market and easily accessible through either the Subway (at the Chatuchak Station) or the Skytrain (at the Mo Chit Station). The park complex offers many kilometers of running/walking/biking trails to allow the city dwellers to get their exercise and enjoy the beauty of the parks. Each of the park areas has a particular feel as described below. 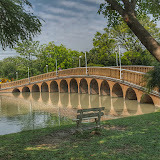 ​Chatuchak Park is separated from the other two parks by Kamphaeng Phet 3 Road. Chatuchak is more of an exercise park, with exercise stations and a wide and long jogging trail surrounding the lakes. The park is dominated by a long lake bisecting the center of the park and providing fantastic views and wildlife on your walk around the park. This park is also most crowded due to its close location to both Bangkok's subway and skytrain. ​Wachira Benjathat Park (also called Rot Fai Park) historically was an old train station area which was later used as a golf course. This Park still feels like a golf course with long fairways and many water hazards. The golf course layout can still be seen in the layout of park walkways. This park has a great Butterfly Garden and insectarium where technicians hatch a variety of colorful butterflies which are allow to roam freely within a aviary style enclosure. 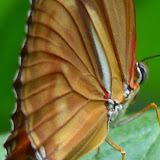 This allows for up close inspection of the butterflies and affords great photographs and videos. This Park also has the Bang Sue Environmental and Education Center, whose primary focus is educating the visitors of the facility on the importance of environment resources. The focus of the education is conservation as well as integrating and promoting the healthy urban environments. The building design is quite unique in that the entire side of the building which faces the park has a 100-meter-long active waterfall. The water feeding the waterfall is recycled water which is first treated in the waste water treatment plant which lies beneath the building. 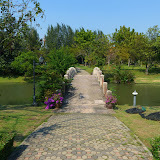 ​Queen Sirikit Park is a beautifully manicured garden area. This park has three circular ponds throughout the park which provide an ideal environment for interesting water creatures as well as a variety of colorful birds. The ponds are all connected through a series of paths and bridges. The ponds are surrounded by a variety of gardens, each with its own unique landscaping theme including a great lotus garden, a high recommended must see. The lotus garden is located north of the circular ponds yet connected through the walkways. The park complex offers a lot to do for anyone with a lust for the outdoors after living and working in the metropolitan area of Bangkok.